Dr. Awesome took me to a restaurant called Seasonal for my birthday last year. We had the seven-course chef’s tasting menu with the wine pairing. Needless to say, it was one of the best birthday meals (and meal in general) that I’ve had. So when word spread that the people of Seasonal were opening a less expensive place down on Avenue C in the East Village, we knew that it would be an obvious stop on our gastronomic adventures. I think I started this blog a couple of days after we went to Seasonal and wish that I had documented the event. Edi and the Wolf is located on Avenue C, off of East 7th street. It doesn’t look like much from the front (there’s a lot of wooden boards surrounding the outside) and doesn’t have the name outside anywhere (that I could see). We walked in and it’s a very charming, little place that had your quintessential Germans/Austrians sitting at one table, enjoying themselves (Dr. Awesome and I also encountered something similar at Seasonal where there was a really old German/Austrian guy who was totally drunk out of his mind. It was quite entertaining). 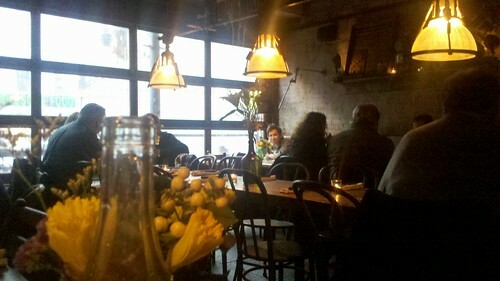 Later on, I realized that the chef knew these people and sat down with them to enjoy some wine. The ambiance of the place, I later read on their website, was inspired by a type of tavern in Austria where we’re supposed to experience a type of coziness. I can definitely say that they’ve created a great atmosphere. 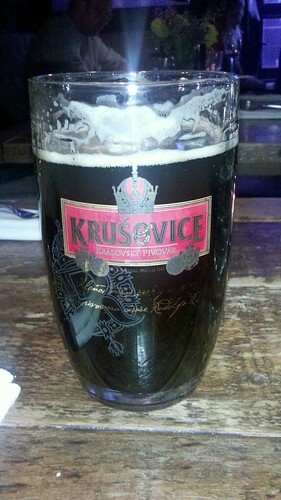 How can one not start out with a large mug of dark beer (only $7!) 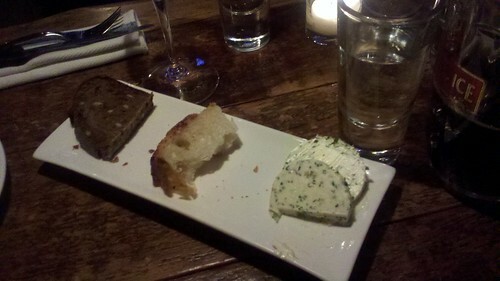 and some homemade bread with herb butter. One thing I noticed when I visited Germany years ago, was that they had such amazing grain breads. I seriously couldn’t get enough of them. They were so packed with seeds, it was unreal. Edi’s brown bread reminded me of that, which was nice. I’m apologizing for the photo quality of some of these pictures. I only had my camera phone with me. 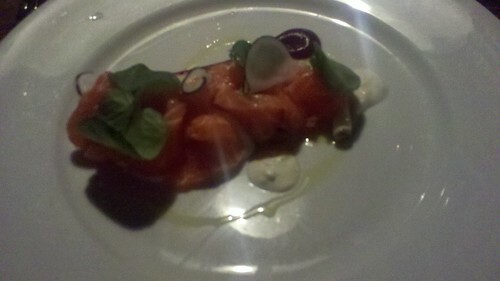 I started off with a special appetizer they had with smoked trout and pickled vegetables with a beet puree. Dr. 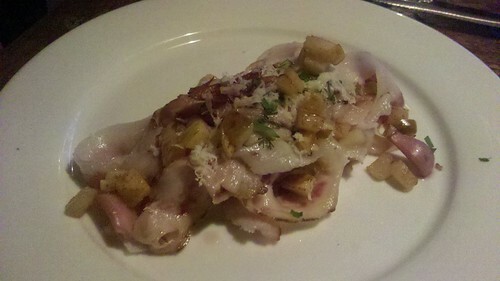 Awesome, of course, had the cured pork belly with horseradish, pearl onions and quince. 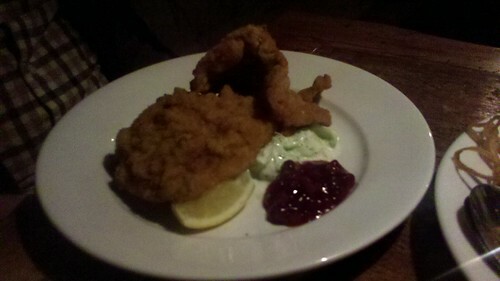 Both dishes came with potato salad, cucumber (in a cream/dill sauce) and lingonberry jam. 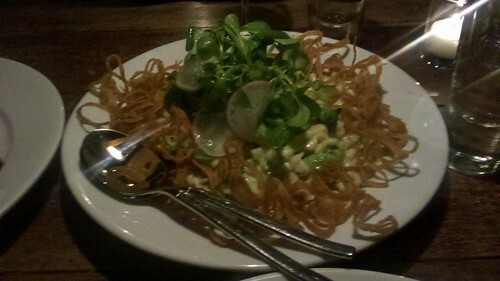 We also had to order a side to share of their spätzle which was mixed with wild mushrooms and brusselsprouts (and I think some cream sauce or cheese) and crispy onions. We both really wanted to try a dessert, but had no room left. The prices are pretty decent, as is Seasonal’s, and all the food was great. Granted we had to wait a little bit for it to come out, but it’s totally well worth it. Guy: What type of place is that? Guy: what type of food? Guy: Is it good? What is Austrian food? Me: Yes very. 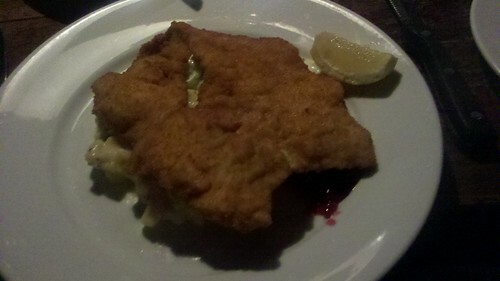 Schnitzel and stuff. Guy: Why do they need an Austrian place here? There’s a German place right across the street! I think this place would be great for a group of people to get together and just relax after a day of work. If you want a more fine dining experience, go to Seasonal. I believe they also have one Michelin Star. Great Austrian food in the city. Who knew? ~ by Rori on April 6, 2011.